Buying or Selling a Home? Check for Radon! Are you Buying or Selling a Home? Make sure you check for Radon as part of the process! Congratulations, you found a potential buyer for your home! Or are you looking to purchase? Either way, get ready for the mounds of paperwork and the many hours of checking off lists and muddling through the real estate transaction process. An important item that should be added to the checklist is testing for Radon. Whether you are the buyer or the seller, it is important to know what Radon is and what needs to be done before the transaction can go through. First, what exactly is Radon? 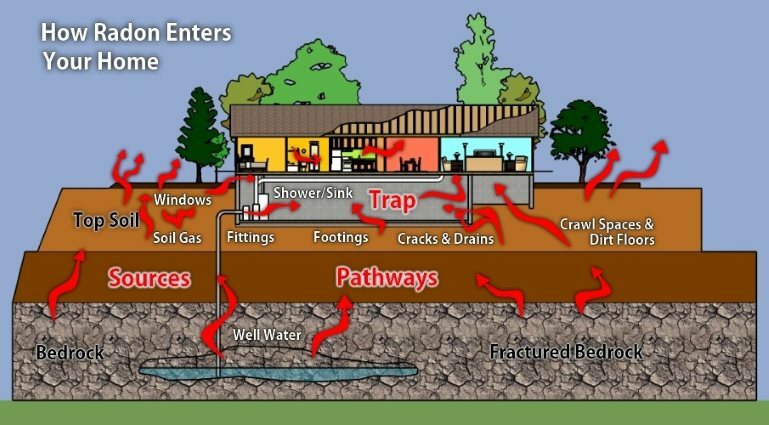 Radon is a radioactive gas that leaks into the home from the ground through cracks in walls or floors, through construction joints, or gaps around pipes. Radon is produced naturally through the decay of uranium found in soil and, though it can be found in homes across the United States, it is particularly prevalent in Northeastern PA. It is the second leading cause of lung cancer nationally and the leading cause of lung cancer among non-smokers, making it a serious health concern. The only way to know if it is in your home is to test for it because it is odorless and colorless. Because of the severity of the effects of Radon, it is often recommended that testing be done as part of the home inspection prior to the purchase of the home. Many Home Inspectors are able to perform Radon Testing for you, however the State of Pennsylvania does require that Testers, as well as Radon Mitigators, be licensed with the state DEP. According to Pat Russell of All in One Home Inspections in Hawley, PA, "Some banks are now requiring radon testing to be included in the home inspection." Multi-family homes of four units or more that are financed by HUD are also required to be tested. If the test comes back at or above 4.0 pCi/L (picocuries per liter) a mitigation system should be installed by a licensed professional. Some new homes are being built with a "passive system" already installed. A passive system consists of a vent pipe but has no fan, which is intended to release the radon gas. These systems are not always effective and, unlike with an active system, the installer is not required to be certified or licensed. Therefore, it is recommended that any home with a passive system also be tested for Radon. If high levels of radon are found in the home, this information must be disclosed to the buyer of the property. Who pays for the Radon mitigation system to be installed is determined on a case by case basis. While the seller often absorbs the cost in order for the sale to go through, this is not set in stone, especially if other concessions have been made by the seller during the transaction. The discovery of Radon can cause a deal to fall through however, as Jackie Ruddy from Jack Ruddy Real Estate in Dunmore, PA puts it, "A high level of Radon is correctable and does not have to be feared. It doesn't have to be a deal breaker." Installing a radon system is easily done by a licensed professional with the right equipment and can be installed usually in one day in as little as 4-5 hours. The cost varies depending on the type of fan used and the size of the home but, the cost is minimal when the consequences of not fixing the problem are so high. As geological changes, nearby construction, and remodeling may affect your Radon level, the EPA recommends that Radon testing be performed every 2 years. This includes properties with Passive and Active Radon Systems installed, as these changes can impact the affectiveness of these systems. Disaster Blaster is licensed to install Radon Mitigation Systems and is willing to help you through the process, Contact Us at 570-963-1123 if you test high for Radon in your home.